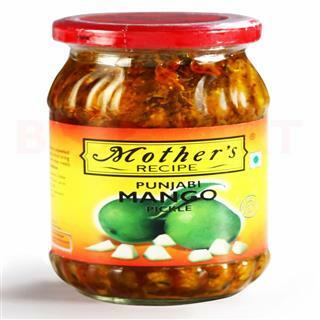 Mother's Recipe Mango Pickle taste is so genuine that immediately takes you to the traditional local kitchens. It is a mixture of luscious green mangoes with reliable spices. It arranged from mango and other spices. It is very piquant pickle. This followed the exact regional techniques faithfully and evolved these luscious pickles. A great accompaniment with any meal, it is a must have in every Indian kitchen. Pickles add an extra touch to your lunches or dinners. In fact in most households, meals are incomplete without this great Mother’s Recipe Mango Pickle. Buy Mother’s Recipe Pickle online now!